The Christmas holiday is over. Surrounded by the carnage of torn wrapping paper and mangled boxes, we look to the future. Soon, it will be New Year’s eve. Maybe because it’s a “natural” transition…or maybe because it’s tradition, we tend to start thinking about the past and looking to the future. From this has arisen the idea of the New Year’s resolution…the promise of change that we make to ourselves to hopefully make the next year a little better than the one that just passed us by. Truth be told, I’m not a big fan of the resolution. Well, that’s not true…I’m all about making resolutions and change for the better. I just don’t see why we should only do it once a year. I figure if you need to change…then change. Don’t wait for an arbitrary date to do so. However, that’s not the point of this article. No…I want to speak to you about HOW to change…not when or why. I. Ever struggled with making changes? If you answered “no” to that question, you are either the luckiest, most enlightened person in the universe…or a total liar. Everyone struggles with change. Change is difficult. It’s stressful. “I don’t have a problem…YOU have a problem”– (Precontemplation) – Not considering change. Doesn’t recognize there’s a problem. “Ignorance is bliss.” You probably won’t recognize if you are in this stage…but you will know if a loved one is here. If your child, spouse, friend, etc is here, then your goal is to raise awareness. Make connections between the person’s behaviors and the problem at hand. I often find myself saying “How’s that working for you?” to clients stuck at this stage. “I know I have a problem, but what can I do about it?”—(Contemplation) – Recognizes there may be a problem or a need to change, but doesn’t know what to do about it. Most of us become aware at this stage. We often try to force a change here but this is a mistake. Because we don’t know everything about the problem any solution we come up with is liable to be inadequate. It’s like trying to bake cookies without reading or understanding the recipe. The goal here is to be patient and really understand the problem thoroughly. Once you understand it, then you can change it. 3. “I know what’s wrong, just need to figure out what to do about it.” – (Preparation) – Recognizes a need for change and is starting to explore the problem and come up with a plan to address it. Here we start putting together a plan for change. We draw on all our resources to get ready to change. 4. “I’m working my plan!” – (Action) – Recognizes a need for change. Understands what needs to be done, has a plan and is “working” that plan. Pretty straight forward. This is where most of want to be but try to get here too soon. 5. Maintenance – Has achieved the desired change and is now actively maintaining that change for the long haul. 6. Relapse – Due to unforeseen circumstances, has reverted to old patterns of behaviors and regressed. It is important to note, while most people go through the stages in order, one does not have to go through ALL the stages. One might go from precontemplation to action in a short period of time if a plan comes together. One might also move backwards through the stages if bad things happen. Also, one can be in different stages of change with different problems all at the same time. 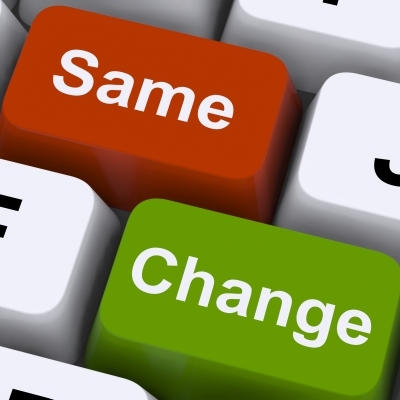 The bottom line is, change can be complicated and messy (no surprise there, right?). What does this have to do with you and your New Year’s resolution? Everything! If what you are trying to change does not match up with your readiness to change (the stage you are in) then you are most likely doomed to fail from the get go. So, take a good long look at what you are planning to do. Examine where you are at…be honest with yourself. What stage are you at? Once you figure out that, then the next steps become easier to figure out. Match what you are going to do with the stage you are in and work towards the next stage your chances for success are increased. So, let’s say you are in the contemplative stage. You know that you need to change but are not sure what to do. Your task then is to understand the whats, whys and wherefores of your desired change. How did the problem come about? What are the resources you bring to bear? Once you gain enough understanding, then you can move towards preparation and make a plan. Let’s say you are at the action stage. Great! Work your plan…but how are you going to maintain the change? What are you going to do if things go off the rails? Figuring that stuff out ahead f time can increase your chances of success. What if you are in maintenance? You’ve made that change and are successful? What happens if you relapse? How are you going to view yourself? Do you have a plan to get back on track? If you do, then your chances of overcoming a setback are much greater.